1) This paper was presented at FIG Working Week in Rome, 8 May 2012 and describes twelve trends relevant for land administration systems. These trends are related to actual and future user demand in society. Trends, developments and proposed concepts are explained and examples are given of land administration products, services and business approaches recently developed at Kadaster in the Netherlands. Society is changing permanently, due to economic and political changes, technological development and globalisation of our challenges (environment, population, natural resources etc.). As a result we adapt our land administration systems continuously, anticipating as good as possible to user requirements in the (near) future. In this paper twelve trends relevant for land administration systems are taken as a starting point (Lemmen et al, 2011). These trends are related to actual and future user demand in society. To provide a usable framework for system design and maintenance, the user demand for geospatial information is linked to the development concept of ‘people, profit and planet’. Our information supply on land administration should be supportive in the balanced analysis, monitoring and planning of land use and ownership, accounting for all three of these elements. This information modelling approach applies both to developed and developing countries. At Kadaster in the Netherlands products, services, the area of application and business models change. There is a clear movement from data deliverance activities towards (integrated) information and knowledge supply. New business models like governmental open data policy influences our way of work and the area of application changes both in theme as in geography. In Europe, cross border developments become more important. Also the role of the user changes (both professionals and the general public), resulting in self service and crowd sourcing initiatives. And the collaboration between governmental organisations, universities and private companies is becoming more and more a prerequisite for keeping pace with developments and user demands. In this paper trends, developments and proposed concepts are explained and examples are given of land administration products, services and business approaches recently developed at Kadaster in the Netherlands. Society is changing permanently, due to economic and political changes, technological development and globalisation of our challenges (environment, population, natural resources etc.). As a result we adapt our land administration systems continuously, anticipating as good as possible to user requirements in the (near) future. The society driven evolution of land administration systems as described by de Zeeuw and Salzmann (2011) has been translated into an analysis and overview of long term trends (2020) and the definition of a perspective for land administration system design by Lemmen et al (2011). The distinguished twelve trends serve as a basis for trend analysis. This paper aims to add a framework to these developments in order to better understand the value of information systems to society and to help understanding the final use of our information systems and infrastructures in society. This is based on the practical experience the Dutch Kadaster has, in meeting up with the rapidly developing societal information demand in the Netherlands. The framework of ‘people – profit – planet’ is linked to the user demand of geospatial information infrastructures, of which land administration systems form a part. It is believed that this conceptual framework also applies to other countries and situations. In chapter 4 some examples are given of how Dutch Kadaster is developing new products and services that fit to this framework and match with the user demands within Dutch society. This user demand is influenced by both technological push (‘what is possible’) and societal pull (‘what is needed’). These developments go to fast for an organisation operating on it’s own. To meet up with the expectations collaboration with other parties is necessary and new business models have to be adapted. In this paper twelve trends relevant for land administration systems are taken as a starting point (Lemmen et al, 2011). These expected trends influence the way land administration systems are being developed to meet up with actual and future user demands in society. Mature information infrastructure – People expect a permanent (24/7) accessible network where (geo)information is correctly linked and versioning, multi-temporality, accuracy and quality meet the user requirements. Dynamic process models – Based on well agreed information standards (ISO, CEN, INSPIRE) it will be possible to model social and economic processes dynamically. Future developments and impact of policies will be established more and more using dynamic process models. 3D/4D space and time administration – The increasing complexity of modern land use will ask for more sophisticated data storage and handling. Rapid developing technology will allow for three dimensional and multi-temporal data storage and handling. Parcel design applications – Land administration systems will evolve from registration systems towards design systems for land use planning purposes. More than traditional rights, restrictions and responsibilities – There will be a demand for a wider range of registrations like carbon rights, water right or mining rights. This information demand will be linked to traditional land registration systems. Faster and more direct updating by actors – Web services will allow for various partners in an information chain to contribute to the actualisation and improvement of the original datasets like the land registry. International seamless registration – Due to international standardisation (like INSPIRE) national registrations can be better exchanged and linked. Cross border activities can be provided with uniform data and information flows. Semantic web-based content – Formalized semantics will allow for access to all information in an unambiguous and understandable way. Also the correct exchange of data between different information systems will be possible based on commonly shared ontologies. Mobile applications – Information services will develop from an internet environment towards location based services (with internet and mobile devices as basic services). Monitoring applications – Remotely sensed data and the use of sensor networks will allow for the monitoring of changes in our environment to be used for decision making an planning. Community driven cadastral mapping – Crowd sourcing techniques may allow for more efficient and reliable collection of property data leading to a more cost effective collection of data. OpenCadastreMap – (Local) communities can enforce the recognition of customary rights by applying crowd sourcing techniques and community driven initiatives. This will influence the role and function of formal systems like national land registry services. Considering these trends, it is a difficult for land registry organisations to keep up with the developments and demands. However, they can’t be stopped and perhaps the most influencing trends can’t even be foreseen at this time. This means that we have to be prepared, flexible and willing to change our way of working and thinking. Taking in mind these twelve relevant trends, the development of land administration systems will become more and more user demand driven and an inevitable part of Spatial Data Infrastructures (SDI’s). To provide a usable framework for system design and maintenance, the user demand can be linked to the development concept of ‘people, profit and planet’. Insight in the issues that users have to solve can be valuable knowledge in system design. These issues are divers, difficult to predict and do change in time and place. Still, both for commercial and governmental professional users, it can be expected that the use of good land administration data in a (national) SDI, should contribute to their corporate social responsibility. Thinking in terms of people - profit – planet, can help in this understanding. The principal of ‘people - profit – planet’ is used in the domain of sustainable development (Elkington, 1994). ‘People - profit – planet’ captures an expanded spectrum of values and criteria for measuring organizational and societal success: economic, ecological, and social. With the ratification of the United Nations and ICLEI TBL standard for urban and community accounting in early 2007, this became the dominant approach to public sector full cost accounting (ref., Wikipedia). The principals have become the basis for corporate social responsibility. By translating this so-called triple bottom line to the design of an SDI it can be of help understanding the future user demand of our land administration systems. Our information supply on land administration should be supportive in the balanced analysis, monitoring and planning of land use and ownership, accounting for all three of these elements. This information modelling approach applies both to developed and developing countries. Land administration services are considered to be an important component of a national geospatial data infrastructure (NSDI). In figure 1 it is shown how geospatial information is linked to this concept of development. To clarify better, the information is translated into three different types of information. To support ‘people’ related information demands, so-called ‘ego-information’ is required. For example the use of navigation systems (‘where am I?) is considered to be a form of ego-information. ‘Profit’ related information is referred to as ‘econ-information’. This information is necessary for making economic choices and performing financial analysis. Our information describing the ‘Planet’ component is referred to as ‘geo-information’ (information describing our physical world). For example our topographic data datasets play in important role in land use planning in the Netherlands. But also the geodetic reference system Kadaster maintains is of an essential value of linking the national available geo-information to the geospatial databases in the Netherlands. Combining the three types of information the total of information supply could be indicated as ‘Egeon-information’. In the development of data sets and infrastructures it is important to realise that information is required on these three different components. So our land administration information should be of value in describing the real world situation for people, profit and planet purposes. Figure 1. 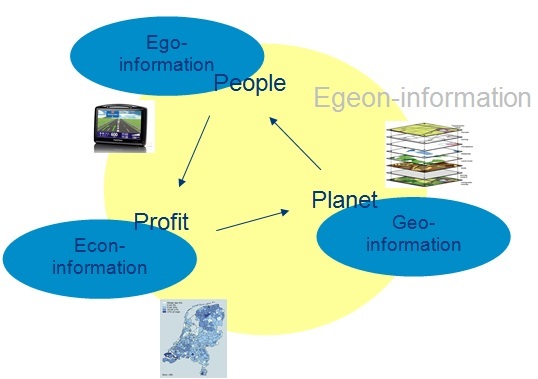 People, profit, planet in relation to information sources in an spatial data infrastructure, together referred to as ‘egeon-information’. Our information services are developing fast from a plain national registering service towards a the function of a national centre for geospatial information, required in all kind of activities regarding planning, monitoring and analysing. Location based services and augmented reality (AR) applications become part of societal demand. Therefore Kadaster has invested in the facilities to present it’s data using augmented reality (using 3D glasses or AR technology as developed by a company called Layar). Also developments have started to provide our data to smart phones through modern Apps (like Iphone or Android Apps), rather than using texting services as we have used for ‘WoningWizard’. All these initiatives have been started in close collaboration with other (commercial) parties. In 2010 Kadaster has started a project called ‘Provisional cadastral boundaries’. As the time between deed registration and parcel creation after field survey is long (from 6 to 12 months), the registration and map seems temporarily inconsistent, causing a complex database system. Hence, a solution in the cadastral update process is being developed. In the future mutation process, parcel creation will be done before deed registration with provisional boundaries and parcel area. A simple verification of geometry of the new boundaries will be done in the terrain later on. To facilitate this process a web application (called ‘Splits!’) is being developed. This application allows the owner or notary to prepare a request for parcel division with provisional geometrical data of the new future cadastral boundaries, using a web based geographic information system. In this way an extreme improvement will be made in the actuality of the data on private and public ownership in the Netherlands. Since the economic and bank crisis started in 2009, the cadastral database in the Netherlands has gained in importance and use. It’s function as the formal registration of property remains important, but nowadays also the analysis of the development in the real estate market and the value of our national mortgages have become important information flows, provided by Kadaster. This information is made publically available at a monthly basis through our website (see www.kadaster.nl/perskamer/dashboard, only in Dutch). In figure 2 an example is given of a graph representing the economic data provided on the development of the average house price in the Netherlands in the year 2011. Figure 2. Example of Kadaster dashboard information, provided on a monthly basis. In this figure the development of the average house price is given for the year 2011. Our web services to our professional customers are evolving rapidly. A chain integration project for property registration (the so called ‘KIK’ project) has resulted in the possibility for the automated acceptance and mutation of mortgage deeds and deeds of transfers, both improving our services to notaries and banks. But not only the demands of commercial banks are met much better, also collaboration with national and on-line property brokers is initialised. The integration of our information services improve their commercial web based applications (e.g. www.woningwizard.nl, www.funda.nl, www.woningquote.nl). The Key Register Cadastre, along with the Municipal Personal Records Database (GBA) is accessible via the www.MijnOverheid.nl website. After identifying themselves using their electronic ID, private individuals can consult the rights that have been registered for them in the Key Register Cadastre. This consultation is free of charge. In the event people believe they are registered incorrectly, they can report these errors via the Kadaster website, again using their electronic ID for identification purposes. Kadaster has added many new registers and services to its responsibility the last few years (like topography, addresses, buildings and pipes and cables). As a consequence much information necessary to describe the physical state of our country in for example a map, comes from Kadaster in the form of authentic registrations. This authenticity is essential for the national need to map and describe our country in an consistent way allowing for planning, analysing and monitoring our real world situation in virtual worlds using geographic information systems. Our national topographic maps (from scales 1:10.000 to 1:1.000.000) serve as reference maps for all kind of presentations. In order to link the virtual mapped world to the real world situation a good quality reference system is needed. According to modern standards Kadaster maintains this national reference system (called NETPOS) in collaboration with the Dutch Ministry of Infrastructure and Environment. To fulfil the demands of our customers and society, Kadaster has a strong focus on the innovation of products (the ‘what?’ question) and processes (the ‘how?’ question). A firm investment in information technology and infrastructure is indispensible to meet up to these requirements. Nevertheless, it is clear that the solution will not be in making things bigger and bigger. There is a limit to possibilities of up-scaling. Keywords these days are ‘open source, the crowd and the cloud’. As community driven software development reaches a quality level comparable to commercial software packages, the use of open source software becomes within reach of governmental organisations. Especially as the technical support of open source software is taken up, as a new service, by private companies. Kadaster has a cautious policy in the use of open source software, but is open for development. The use of open versus closed source software is highly related to the security level and life cycle of applications. For database management systems our closed source systems are still in place. In the field of analysis and operational tools a mixture of closed source and open source arises, while at the front end (portals, web interfaces, etc.) a majority of open source applications develops. With respect to ‘crowd sourcing’ (or voluntary geo-information provision), Kadaster is a partner in several pilot projects, involving the general public in data provision for our key registries. This paper will not go into detail on possibilities and limitations. But an important restriction one should realise is that in our case crowd sourcing for cadastral purposes is not a community based initiative, but an effort to support a professional organisation in cost efficient data gathering and provide services tot the general public that without their contribution would not be possible. This requires a different attitude from both the Kadaster as from the volunteers providing this data. In 2012 Kadaster launched an App called ‘Grenspalen’ (available in Dutch). This App is freely available through the different App stores (Apple and Android) and refers to locating the exact position of border poles on the border between Germany and the Netherlands. By giving the position of this border poles freely available to the public it becomes possible for them to follow hiking routes following the national borders and to give direct feedback to Kadaster on the position and state of the poles to Kadaster, using mobile devices. New recreational services are provided to the public (‘searching border poles’) and information on the status of the border post is given to Kadaster on low cost basis (it is not longer necessary to visit the poles on regular basis by professionals). In the IT world ‘cloud computing’ is strongly believed to be the only way to keep up track with user demands for data retrieval, management and analysis. Commercial parties start offering software, platforms, infrastructures and services in a cloud environment. Kadaster is in a phase of reconnaissance of our possibilities. It is realised that it is unavoidable and offering a lot of potential, but also that many quality and security issues are still to be solved or to be clarified , before certainly right data can be brought into ‘the cloud’. At the national level the demand for an Open Data policy is growing in the Netherlands. Data from national key registers should become wider available among governmental organisations, for research institutes and also for commercial use by private companies. As the collection, management and provision of data is not a cost free activity, many (political) discussions took place on how data can be made available in a open way, maintaining the high standard on quality, actuality and reliability that exist on (authentic) registers in the Netherlands. As a first step, in January 2012 the topographic data of Kadaster have been made available under an Open Data policy. This means that a new business model has been defined for the cost recovery of the services Kadaster provides and new license models for the use these data have been established. A challenging development, with high societal impact. Apart from the financial investment that is required to meet the actual societal user demands for our data and services, effort is being put into capacity building of our own personnel and the clever building up of networks and alliances. Our organisation transforms from a production type organisation into a knowledge driven shared service centre, with a national and international importance. This asks for continuous adjustments to our position, personnel and functions. Coming from a national monopolist situation, we become more and more an indispensible link in a chain and an international context. Its becomes our task to co-create the evolution of land administration and spatial data information systems. We have to match users’ expectations and technical possibilities with existing (and often sound) legal and business rules and processes. The traditional integrated approach of cadastre and land registry in the Netherlands (and the movement towards more positive legal status of the registration) has been extended with the national topographic mapping since the late nineties. Recently also services for addresses, buildings, cables and pipes have been added to our organisation’s responsibilities. In 2012 it is expected that the national information provision service for taxation on housing and the large scale base map of the Netherlands will be added to this. Kadaster as an organisation is moving towards a national centre for geo-information services, rather than a pure cadastral agency as the name implies. Looking back at the last decade, we can conclude that our systems and products have changed a lot. Not only many new services have been developed based on the same set of basic data, but also many new registrations have become part of an integrated geo-information organisation, as Kadaster is today. The use of our data and services is being applied in the domain of people, profit and planet. Regarding the trends as described in this paper organisations like Dutch Kadaster need to adapt and rethink the design of it’s systems, services and strategy. Thinking in terms of ‘people – profit – planet’ with respect to the user demand of our data provision and services helps in understanding the (future) needs when we define our systems and services. New challenges for Dutch Kadaster are defined by the crowd, the cloud, open source and open data. This asks for permanent evaluation of our business strategy and further collaboration with other parties from government, research organisations and private companies. Elkington J. (1994), Towards the sustainable corporation: Win-win-win business strategies for sustainable development. Lemmen C., P. van Oosterom, C.J, de Zeeuw and M. Salzmann, M. Wubbe (2011), Society driven innovations in Land administration. 3rd Cadastral conference, Warsaw, 23 – 25 November, 2011. Zeeuw de, C.J. and M. Salzmann (2011), Cadastral innovation driven by society: evolution or revolution? FIG working week, Marrakech, Morocco. Kees de Zeeuw is director of Kadaster International, part of Cadastre. Land Registry and Mapping Agency (Kadaster) of the Netherlands. He has an academic background in environmental and geo-information sciences working at Wageningen University and ResearchCentre. After three years being responsible at Kadaster for product and process innovation at the GEO department (2007 – 2010), he now is responsible for the coordination of Kadaster’s international activities and international cooperation projects. Kadaster International provides world wide advisory services in the domain of land administration, e-governance, geo-information services and spatial data infrastructures.